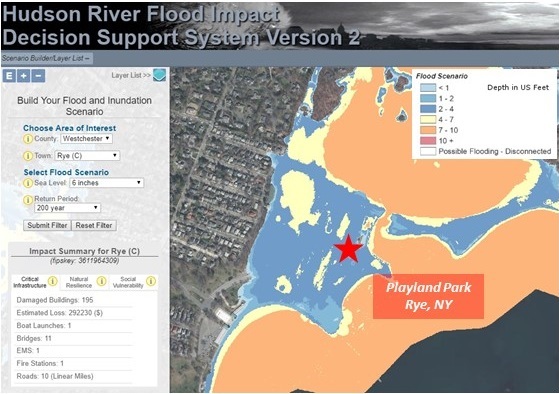 The Hudson River Flood Impact Decision Support System is an interactive map application that allows users to evaluate the scale of potential flooding for tidally-affected shorelines of the Hudson River Valley and Westchester County under a variety of sea level rise and storm scenarios detailed here. 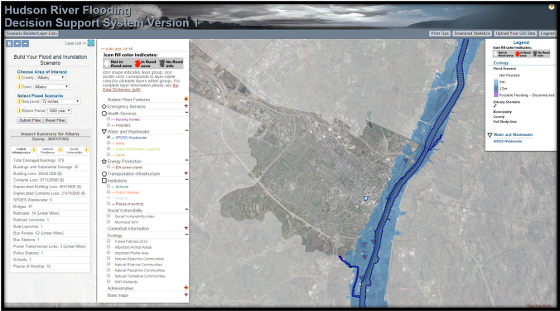 The data, maps, and information in the Hudson River Flood Impact Decision Support System are provided to illustrate the scale of potential flooding in the Hudson River Valley under different sea level rise and storm scenarios. The information can help municipal and regional planners prepare for future floods. Precise estimates of future flood risks remain uncertain given a range of possible sea level rise and storm scenarios, but with adequate preparation and education, individuals, communities, and municipalities can take action to make themselves more resilient. The sea level rise scenarios available within the tool range from 0 to 6 feet above the base mean sea level of 1983-2001, a standard sea level used by the National Oceanic and Atmospheric Administration (NOAA). In addition to sea level rise, users can also choose from storm scenarios ranging from the 5-year to the 1000-year flood. Critical infrastructure such as transportation and emergency services can be viewed along with the flood maps, to identify those that could be vulnerable to flooding in the future. A unique aspect of the information presented here is that it includes freshwater flowing from tributaries into the Hudson, in addition to tides, storm surges, and sea level rise. This means that it captures the effects of rainfall to the extent possible, which can be particularly significant in the upper parts of the Hudson, just below the Troy dam. However, it is important to note that tributary floodplains are not included in the modeling and mapping – the flood maps show only the Hudson River’s floodplain. The model used here is the same one used for the New York Harbor Observing and Prediction System (NYHOPS; http://stevens.edu/nyhops ). Current projections from the updated ClimAID report still show great uncertainty in future rates of sea level rise, with projections for the year 2100 ranging from 1.25 to 6.25 feet near New York City. Tools such as this Hudson River Flood Impact Decision Support System can help plan even in the face of uncertainty. For an introduction to the map application, see the Story Map. 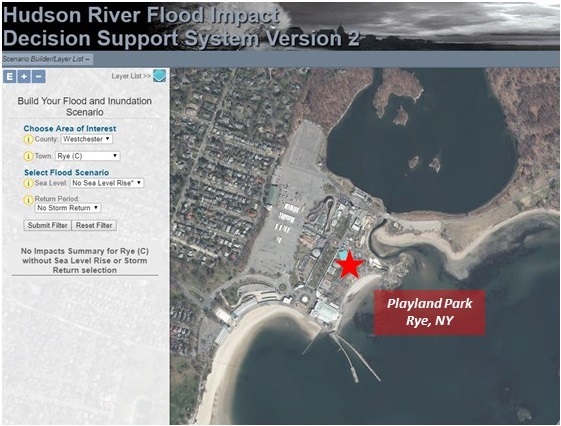 The below image is a screenshot from the webmapper highlighting Playland Park, located in Rye NY, with a typical Hudson River extent. Alternatively, the below image highlights Playland Park under the 6 inches of sea level rise, 200 year storm return flood scenario. Mark was the original Principal Investigator for this research. Without his vision and leadership we would have never achieved this work.